The inspiration for me to write this story came from the wonders of the modern communication, Internet and email. The story I about to share with you was my recent encounter with four senior students from Dundee University, Scotland. It is hard to believe that someone would travel thousands of miles to meet somebody, but with trust and faith, distance is not an obstacle. Ding-Dong! A handsome young Caucasian pushed the doorbell while three other guys peeped through the big glass window. The patients, waiting in the lobby, greeted the four young gentlemen as they entered. Pooh, a very friendly and soft-spoken receptionist, welcomed the four men and humbly led them to Dr. Lily who was discussing a dental plan with her patient. 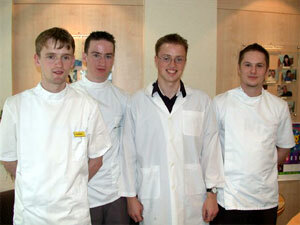 Ross, Kris, David and Paul were senior students from the Faculty of Dentistry, Dundee University, Scotland who came to visit and observe dental work in Thailand. Kris explained that every year, students at Dundee University will travel overseas to observe dental works and hospital management. They planned to visit 5 countries which include Thailand (Samui, Phuket), New Zealand, Australia, Fiji and U.S.A. About a year ago, Ross surfed the Internet for dental clinic in Thailand and he found my web site, which had just been posted on yahoo search engine for only a few months. Ross was responsible for contacting a dentist in Thailand, so he emailed me and asked a permission to visit my clinic. Astonished with his request, I gladly accepted. I told him that I have worked in my small clinic for 15 years; however, I have many experienced staff who could assist me to solve all kinds of difficult dental problems. I believe in personal services where I can interact with my patients over a cup of coffee and talk with them in addition to providing them with the best dental care. Most of my patients become my friends. My clinic is like a 'home'. The patients and staff at the clinic are like parts of my family. The reason why patients come back to me is because I emphasize on the quality of the treatment and the friendship with patients. 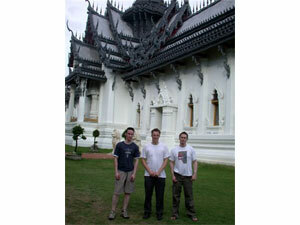 Ross said, "Our plan was to observe cosmatic dentistry in Bangkok for 4 days. Dr. Lily kindly scheduled her patients for us to observe the dental works. 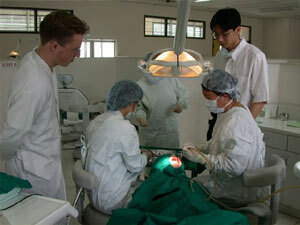 Having received permission from Singaporean and Dutch patients, we were allowed to observe and discuss the dental operation. She even took us to the Bangkok Hospital to learn more about the business management of dental section and showed us the qualified dental laboratory and dental surgery at the Srinakarin University. Dr. Lily also organized a workshop at Srinakarinvirot Prasanmit University for us to observe and learn more about Surgical dental section. It was really beyond our expectation!". At the Ancient City they were not just interested about Thai culture, they also want to learn more about Thai life especialy Thai women. It was one of the reason that Ross and Pual promised to be back again. Besides learning dental works in my clinic, I also want them to learn about Thai culture, so I took them to Ancient City which shows many historical and spectacular landmarks in small scale. It featured temples, palaces, and traditional houses. I also recommend them to try traditional Thai massage which might be useful for their occupational hazard. Their first tries were never been forgotten! Aside from showing them beautiful places in Thailand, I also showed them how to smile from their hearts. 'Smiling' is the beginning of friendship. Maintaining friendship with patients is one of the most crucial things for establishing a long-lasting relationship. Humor and friendly conversation are other important ingredients. Last but not least, I told them that we always have to treat people with genuine and sincere heart. Our clinic is located on Ramkhamhaeng Road, a local residential area. Ramkhamhaeng, a king who ruled Thailand a thousand years ago, was highly honored for his development in Thai literatures and invention of language and alphabet. This road is the heart of education, entertainment, sports and inexpensive shopping paradise. 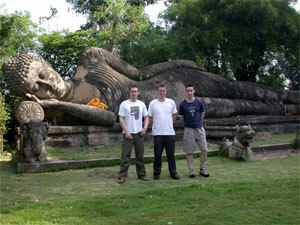 There are also two leading universities, Assumtion university and Ramkhamhaeng University. There is a large stadium, building for ASIAN Game in 1999, and had hosted many national sports events. Liverpool, Manchester United, and Lead United and many other famous soccer teams were invited to play with Thai National Soccer Team here. Moving to a new place in the busy business area was my original plan. More patients, more money but LESS friendship. I tried to measure what is more important to me. I know some very talented dentists who treat as many as 40-70 patients a day. They surely gain a lot of experience in a short period of time, but they did not have time to make friend with patients who mostly want to befriend with. I felt that having a good friendship with my patients is more important than having unacquainted one. For the past 20 years, patients walked into my clinic with pain but walked out with smile. After recalling these memories and consulting with my patients, I have realized what is most important to me. I will not allow business investment to interfere and degrade the quality of my work because customer's satisfaction and perfection are my highest priorities. " This clinic is our home and people here are our friends." I drove frantically to Trok Kao San, a long stretch road of bars and hotels. Within half an hour, they had to board the train to Suratthanee, heading to Samui Island. I got off the car and rushed to their hostel . As I approached them, the four lads ran across the street towards me. They surprised me with a huge bunch of flowers! I reached out my arms and held them tightly. Feeling overwhelmed with such a wonderful friendship, my eyes burst out into tear. As the taxi driven away, I wondered if my heart is still with them. I wish them luck and a safe journey. Time was short but long enough to learn about each other, and I know that we will be good friends forever. I am certain that this is only the beginning of our friendship. They will come back. I voluntarily helped these students because, as Thais, we always welcome our guest with our hearts. I also want to share with other young and old dentists about how important the friendship with patients is. I know that these four men have learned this valuable lesson from me, and I believe that they will become very good dentists in the future.